Myflex pedal cushioning system provides a comfortable workout platform. Self-Powered with Quick Start function for every program and 40 levels of resistance. Integrated entertainment cap for all your accessory enjoyment in one place. Industry-leading electronically adjustable stride; conforms to the user for superior comfort and versatility. Vari-stride programs change stride length to maintain target heart rate, for greater calorie burn, working multiple muscle groups in one session. Myflex pedal cushioning system provides a comfortable workout platform. Energy Smart feature to minimize the energy consumption while product is in idle. Industry-leading electronically adjustable stride; conforms to the user for superior comfort and versatility. Shift-on-the-fly fingertip controls offer 40 levels of resistance and the widest stride range in the industry. Myflex pedal cushioning system provides a comfortable workout platform. 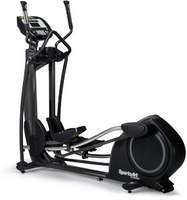 SportsArt G875 ECO-POWR elliptical is part of our green technology product line with integrated micro-inverters built in, and the first of its kind to harness the power of human energy and put it back into the grid. When plugged into a power outlet the human energy generated converts to utility-grade electricity, offsetting significant savings for the club owner. ECO-POWR Integrated Inverter. Industry-leading electronically adjustable stride; conforms to the user for superior comfort and versatility. Shift-on-the-fly fingertip controls offer 40 levels of resistance and the most narrow range in the industry. Myflex pedal cushioning system provides a comfortable workout platform. 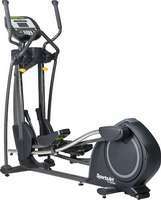 Arizona Extreme Fitness will deliver and setup your favorite quality Sportsart Ellipticals for home or commercial use in Prescott, Flagstaff, Sedona and Phoenix, Arizona at your location. Come on in and browse our 3000 sq ft warehouse showroom in Prescott Valley, Arizona and try before you buy or if you already know what you want just call us for our best price and we will deliver or ship it to you depending on your location in the USA. 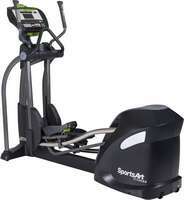 We sell, deliver, setup, install and service the above Sportsart Ellipticals and more.